Now that you’ve completed the first two phases of the Inbound Marketing methodology, Attract and Convert, your potential customers have graduated from strangers to visitors to leads. The next step in your marketing strategy is where it get really good. You finally get to turn those leads into customers. This is what is known as the Close phase of the Inbound Marketing methodology. In the Attract phase, you provided potential customers with the valuable information needed to prove to them you KNOW the solution to their problem. During the Convert phase, you took the next step to show these customers you HAVE the solution to their problem. Now, in the Close phase, you will prove to these leads that you ARE the solution to their problem. How Can I Prove to Leads I AM the Solution to Their Problem? Once you have converted your visitor into a lead, you have to continue to provide them with educational and valuable information. This information will gradually become more focused on the fact that you are the answer to the problem instead of you just having the solution to their problem. This process is known as lead nurturing and is the main focus of the Close step of the Inbound Marketing methodology. Automated Email Nurturing Campaigns: these campaigns are directly triggered by leads performing a certain action on your website or social media accounts. For example, a lead could have filled out a form to download an offer to learn more about your solution to their problem. This offer could be an e-book, a template, a webinar, or some other form of information. Once the customer has filled out the form, they are automatically entered into a list for a nurturing campaign. If you have a CRM program you use, this can be automatically triggered. If not, you can manually begin the nurturing campaign. This campaign will offer them more relevant information that will take them from believing you HAVE the solution to their problem to believing you ARE the solution to their problem. 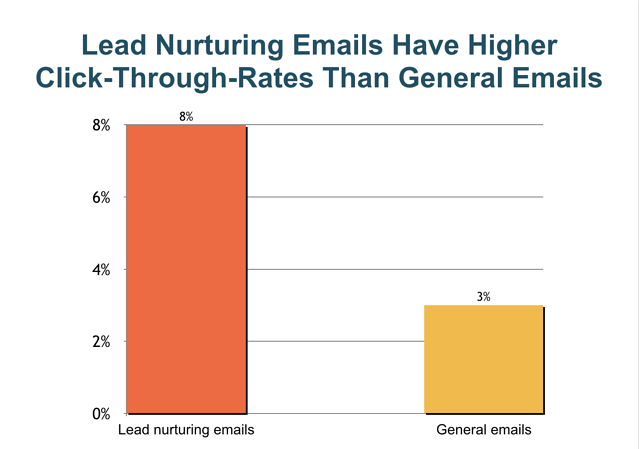 In fact, studies show that lead nurturing emails have a higher click through rate than general emails because the information is more relevant to the lead. These emails can occasionally come over the next few days or weeks, slowly offering to educate them further and provide more valuable information. By doing this, you will prove to them that you are present and are the solution to their problem. Eventually, this will drive them to moving from lead to customer. Email Personalization: after a customer has become a lead, you will have a certain amount of information about them. This information can include an email address, their name, their company, or other relevant information. You can use this information to really personalize your further interactions with the lead in hopes of closing them as a customer. Studies show that personalized emails have a higher open and click through rate than emails without personalization. If you can use personalization in your email marketing to encourage leads to open and click the content, you have a higher chance of closing them as a customer. By using these tactics in your email marketing, you are able to engage with your leads at the perfect moment to move them along the path from lead to customer. CRM (customer relationship management) integration is another important part of closing leads as customers. By entering your leads into CRM tools, you are able to fully organize and track them as they move down the path from leads to customers. CRM tools should offer email automation to make lead nurturing simple and effective. They also should offer detailed contact notes and be able to track leads as they move through your site and your information. The most important function of a CRM tool at this point in the Inbound Methodology is to integrate all the information you gain from leads into systems and campaigns designed to lead them down the path to close. 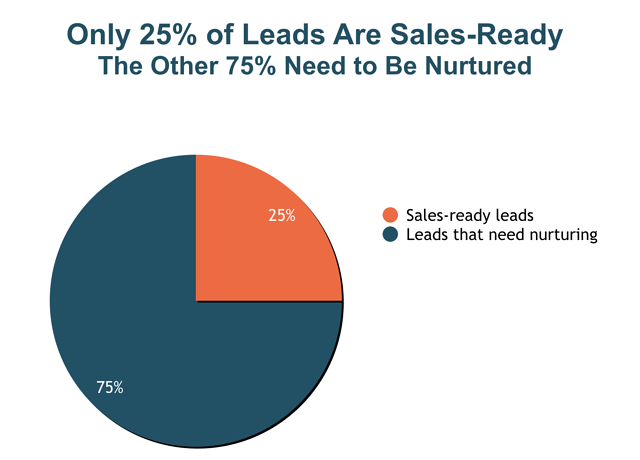 Studies show that only 25% of leads are ready to be closed upon conversion. The other 75% need to be nurtured. This is where your CRM tool comes into play. For example, if you offer a download to your visitors to convert them to leads, you will probably require they give you some sort of contact information. This information will then be entered into your CRM tool. Once you have contact information for your lead, you can use this in a number of ways to nurture this lead towards becoming a customer. You can send them relevant information through your email campaigns, personalize your interaction with them, or even track their interests on your website to see what other value you can provide to them during your lead nurturing. When it comes to closing your customers, the best way to track and organize your movements is through a CRM tool. This will allow you to personalize and automate your interactions with your leads and lead them towards becoming customers. One of the worst things you can do as a business is work hard to generate leads and not see them through to close. 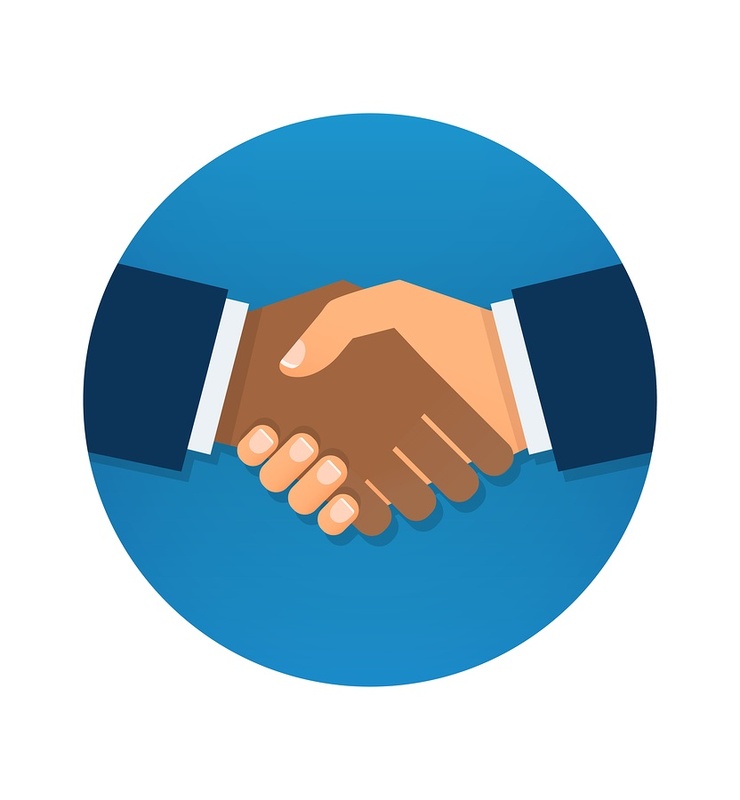 While you don’t want to hard sell your leads, you still want to continue to be in contact with them throughout the process to closing them as a customer. By using an Inbound Marketing strategy, you can continue to stay in touch with your leads and nurture them with valuable and relevant information. This is not selling to them; it is instead proving to your leads that not only do you HAVE the answer to their problem, but you ARE the answer to their problem. This is all done in an educational and non-invasive way that will lead your lead towards closing and becoming a customer. Congratulations! You’ve now completed step three of the Inbound Marketing methodology and turned your lead into a customer. How do you know if your Inbound Marketing strategy is working? By calculating your metrics! Download our Marketing Metrics calculator to quickly get the numbers that matter most.